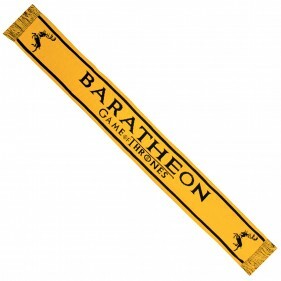 Pledge your allegiance to Storm’s End in the Game of Thrones Baratheon Scarf. The gold knit neck warmer features Baratheon in stately lettering with the stag sigil at either end. Stay warm and defend that you’re the greatest Game of Thrones fan with a fury.